We’re back at The DoubleTree by Hilton Hotel! We’re really pleased to be back at this gorgeous water-side venue which has been extended and refurbed in a multi-million pound project. We have space for many more exhibitors to give you even more choice and variety. 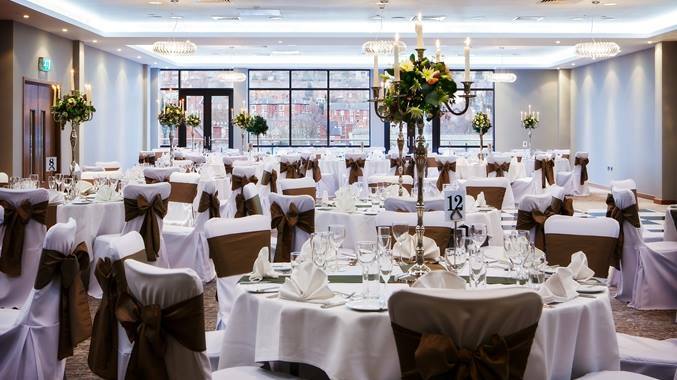 Brides & Grooms love our shows and our show at the amazing DoubleTree by Hilton Hotel in Lincoln will be no exception. A stunning venue packed with nearly 80 stands featuring hand-picked wedding suppliers. The show will provide you with loads of ideas and lots of inspiration. Your wedding might be large or small, modern, traditional or shabby chic but you’ll find the best suppliers for miles at this show. And there are products and services to suit every budget. All our carefully selected exhibitors are experts in their field and you can be sure to find companies who’ll be able to match your dreams and your budget! This Wedding Fayre will have a great selection of all your wedding requirements. Exhibitors include* Wedding Dresses, Venue Decor, Mother of the Bride outfits, Shoes, Flowers, Stationery, Singers & Musicians, Chair Covers, Chocolate Fountains, Tiaras, Bridal Hair-Dressing, Gift Lists, Wedding Insurance, Vintage Cars, Modern Limo’s, Magicians, Casino, Photobooth or Magic Mirrors, Honeymoons, Videographers, Toastmasters, Popcorn & Candy Floss, Cheese Buffets, Children’s Entertainers, Bridesmaid Dresses, Suit Hire & Sales, Beauty products & treatments, Personalised Items, Fun Items, Live Music and more! Every couple will receive a free, quality, goody bag packed with samples, products, vouchers and a glossy magazine! We’ll have live music too! (£4 per person/£10 for groups of 3 or more/Under 16’s free).